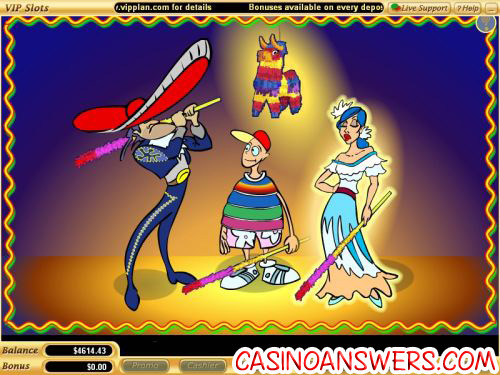 Pinata Fiesta Classic Slot Guide & Review - Casino Answers! Pinata Fiesta is a 3-reel, 1-line classic slot machine developed by Vegas Technology, featuring a wild symbol, multipliers and a bonus game. You can play the Pinata Fiesta classic slot game at US-friendly online casinos Caribbean Gold Casino and Crazy Slots Casino. Bets on Pinata Fiesta are $0.10, $0.25, $0.50, $1, $5 and $10. You can bet 1-3 coins. For the greatest value, make sure to use the “Play Max” button at all times when playing the Pinata Fiesta online slot machine. Pinata Fiesta is a dime slot, so you can bet anywhere from $0.10 up to $30 per spin. For bets other than the 3-coin maximum bet, use the “Spin Reels” button to play the Pinata Fiesta bonus slot machine. The highest paying symbol on the Pinata Fiesta slot machine is the Sombrero symbol. On a 3-coin maximum bet, if 3 Somberos land on the reels, you will win the 2400 coin top jackpot. The Sombero symbol is wild and will substitute for all other symbols in Pinata Fiesta. Also, when completing a winning combination, one Sombero symbol will double your winnings and two Somberos will quadruple your winnings. To try and quadruple your winnings, start playing Pinata Fiesta now at Caribbean Gold Casino! There are 9 winning combinations on the Pinata Fiesta classic slot machine. The full payout schedule is as follows (1/2/3 coin payouts in parenthesis): 1 Tequila symbol (2/4/4), 2 Tequila symbols (5/10/10), 3 of any Chilli symbols (5/10/10), 3 Tequila symbols (10/20/20), 3 Single Chilli symbols (10/20/20), 3 Double Chilli symbols (25/50/50), 3 Triple Chilli symbols (40/80/80), 3 Maracas symbols (80/160/160) and 3 Sombero symbols (800/1600/2400). Pinata Fiesta is a fun slot game that offers a fairly complex bonus game for a reel slot machine. Those who enjoy the Mexican themes will definitely have a lot of fun playing the Pinata Fiesta online slot at Caribbean Gold Casino! Are players from the USA able to play the Pinata Fiesta slot machine for real money? 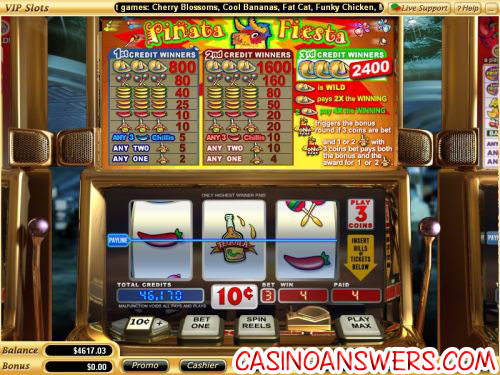 American players are free to play the Pinata Fiesta classic slot machine at their choice of Vegas Tech casinos, including both Caribbean Gold Casino and Crazy Slots Casino. Is there a free Flash game of Pinata Fiesta available? At the moment, there is no Pinata Fiesta Flash slot game available at Caribbean Gold Flash Casino or Crazy Slots Flash Casino. How do I trigger the Pinata Fiesta bonus game? First, make sure you are betting 3-coins per spin. To ensure that you are, use the “Play Max” button to spin the reels. Then, all you have to do is hit one Bonus symbol and you will trigger the Pinata Fiesta bonus game! Hey Dealer Dan what Mexican slot flash games are there?